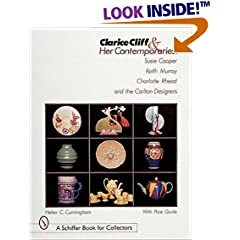 Clarice Cliff was one of the pioneer designers and decorators of highly stylistic Art Deco ceramics during the early 1920s as the sleek, modern style of Art Deco took over Europe and the United States well into the 1930s and up until World War II. 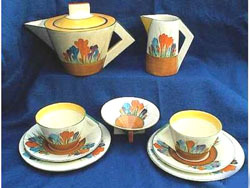 Clarice Cliff used basic pottery shapes which were clean yet angular in appearance, and then decorated them in vibrant colors along largely geometric patterns. Clarice Cliff was born in 1899 in the heart of Staffordshire region of ceramics production in England. Born into a family well schooled in pottery, she left school at age 13 and started apprenticing with local potterys in the area. At age 16, she began working for the A. J. Wilkinson Company in Burslem, England near where she had gorwn up. Colley Shorter, the managing director of the company, recognized her talent almost immediately and they soon even sent her to the Royal School of Art in London to continue developing her skills. Eventually, the company set up a separate studio from which she could experiment with new designs. 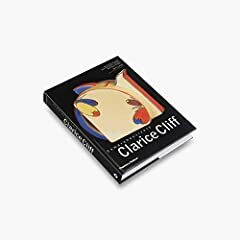 Clarice was always a talented potter, it was not until 1925 when she was exposed to the Exposition Internationale of Arts Decoratifs et Industrialies Modernes in Paris that her creativity came into full bloom. 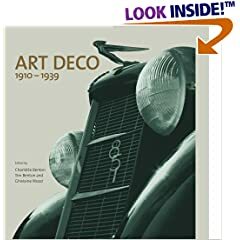 This was the international exhibition during which the Art Deco and "moderne" style burst onto the international design scene, and Clarice was fascinated by the geometrically grounded modern designs being introduced for all the necessary amenities of daily life. WIlkinson had always encouraged Clarice to design her own lines, and she was offered an even greater opportunity to create when Wilkinson purchased the Newport Pottery. Clarice took Newport "blanks" and began decorating her own unique and whimsical designs. In 1928, Clarice Cliff began producing one of her most beloved lines, "Bizarre Ware", which she continued producing until approximately 1937. She even had her all-female group of potters known as the "Bizarre Girls" who traveled the country to trade fairs and shows to promote the line. Cliff adopted the geometric shapes of Art Deco, but she also worked in figural shapes including the well known "Age of Jazz" figures as well as abstract shapes. Her color decorations were vibrant and included the entire hue of colors but especially favoring blue, black, orange, and yellow. Clarice Cliff designs maintained their cheery design aesthetic with couples dancing and flowers blooming despite the years affected by the depression in the early 1930s. The floral works are very strongly collected today, but they were also popular during the period of production. Additional artisans were hired to execute Cliff designs by hand on the company's products, and the "Crocus" pattern became one of her all time best sellers. The success of Clarice Cliff ceramic designs during this period gave her great success and peer recognition in the arts world, still unusual for a woman during the 1930s. In 1939, Colley Shorter's wife died, and he and Clarice were married in the following year. In later years, Clarice Cliff designs lost favor with the public, and the innovation of the twenties and thirties never returned. She and Colley never had children, and Clarice Cliff passed away in 1972. 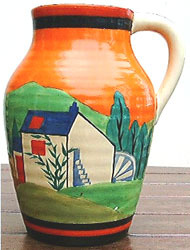 Buy period Clarice Cliff, Rookwood, Roseville, Weller, and other finer art pottery on the Collectics Pottery and Art Deco & Art Nouveau pages, or search the entire site for great antiques, collectibles, and crafts for every collector!